Everyone knows The Departed is a remake of a foreign film, right? When The Raid and Let the Right One In is green-lit for a US, English-speaking production, film-fans complain. But side-by-side, both Infernal Affairs and The Departed stand on their own, and share the same DNA in much more than the story alone. Infernal Affairs is the blueprint for Scorsese and as a plan, it is easy to see why he was so keen to remake it with the Boston-based themes that transferred so well. Tony Rayn’s review in Sight and Sound, in 2004, confesses how “very little in the plot is new”. Indeed, it is a cat-and-mouse dynamic whereby the cop is actually a mole (Andy Lau) and the mole is actually a cop (Tony Leung). One superior officer, Superintendent Wong (Anthony Wong) manages both cops, while the mob boss Hon Sam (Eric Tsang) organises both gang members. The stories weave and intertwine, as both cop and mole are unaware what the other looks like, despite a brief exchange in a music shop at the start, whereby they are oblivious to the key role they play in each other’s life. Infernal Affairs is fast-paced and a rip-roaring achievement as directors Andrew Lau and Alan Mak cut fast, and play with the urban backdrop. Meeting within offices, we feel the claustrophobia of the grey blinds, offices and filing cabinets that surround Inspector Lau. Meeting on rooftops, we see freedom in the shimmering sunlight and bold blue sky. Reflecting on the glass skyscrapers surrounding the criminals and cops, both are controlled and seek freedom. Different actors portray the young cops in training, which can be confusing. But Lau and Mak comfortably move between each story, flashing back in monochrome to clarify moments when they’re unclear. Top-dog Hon Sam, has been cast expertly. His cherubian baby-face charms the young men who work for him, while his beady eyes, when confronted in the interview by Wong, are fearsome and full of the danger that he inflicts on others. In The Departed, Jack Nicholson plays his American counterpart as a deeply despicable, terrifying villain, sucking his teeth to catch the rat. Eric Tsang, on the other hand, conjures up a likeable rebellious father-figure with a brutal, arm-breaking boss captured within the same disguise. Superintendant Wong, in comparison, lacks the ambiguity that the character begs for. Our first meeting between Chan and Wong hints at a corrupted sense of duty. Does he abuse the undercover agent’s position perhaps? This isn’t clarified and only confuses the introduction of the characters. But it is Andy Lau who steals the show. As the self-loathing, corrupt (desperate to escape his hypocrisy) Inspector, his journey is expertly handled. Unlike Leung’s undercover agent who wants out, Lau begins the film as a supporter of crime but discovers that an honest life is preferable. At one point, Leung snorts cocaine in undercover, but there is no sense that he is tempted by this lifestyle. Lau’s clean cut, angular features make him out to be a predatory animal seeking his prey, but the final act reveals how he is actually a deer in headlights, and the mob is truck heading his way. It’s a shame that Andy Lau couldn’t be the ying to Leonardo DiCaprio’s yang in an alternate universe. In The Departed, Scorsese pays tribute visually – and proudly – to Infernal Affairs. It was not a steal of the story for an international market, it was selling the cityscape and incredible sequences that were already in place. 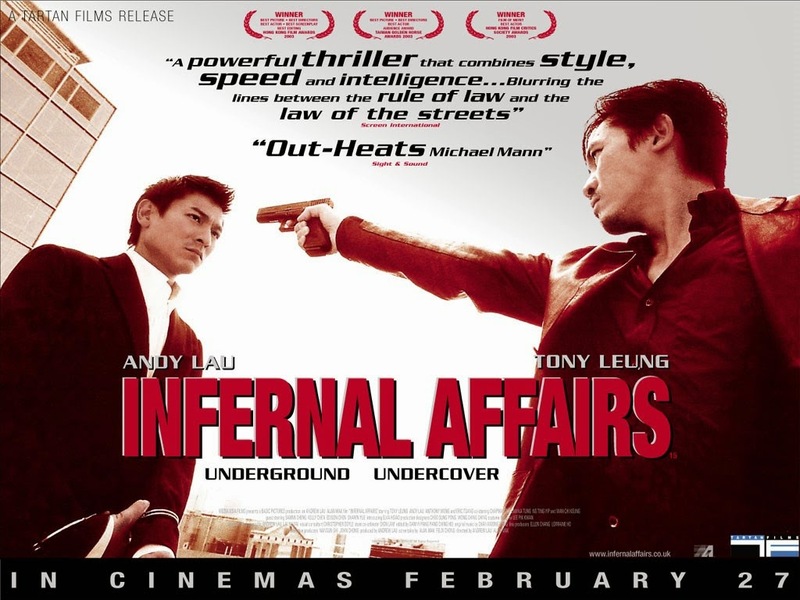 The fall from the roof; Lau spying on Chan, who sits in his office behind the blinds; the envelope with the adjusted spelling – these were all in Infernal Affairs before 2008’s Oscar winner. A staple of Chinese cinema, Infernal Affairs is the action film that Hollywood aspires to make – so much so, it asked its greatest director to reimagine it. And, he didn’t change much at all.